​Maya Cole Wins Bruins' Autographed Jersey. 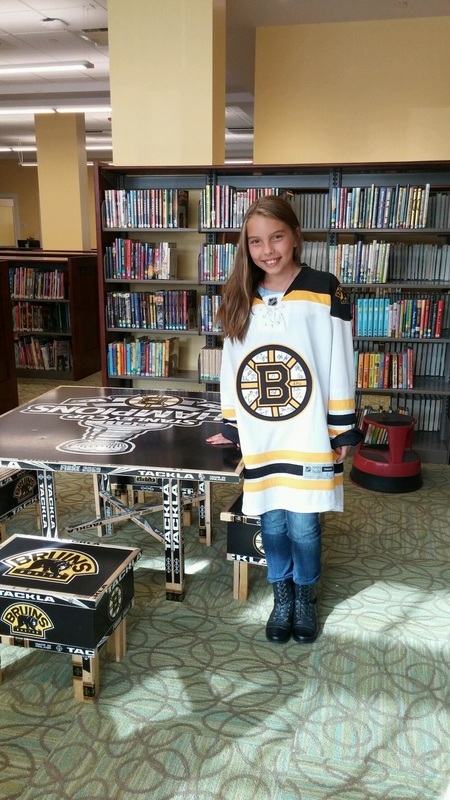 Maya Cole is one of a select group of young people to receive a Boston Bruins prize for their outstanding participation in the Salisbury Public Library’s summer reading program. When program sponsors, the Boston Bruins, the Massachusetts Board of Library Commissioners (MBLC) and the Massachusetts Library System, asked the public librarians to make nominations, Joan Cox, Children’s Librarian, knew just the person. “We have many, many wonderful young people in our program, and I was so happy to hear that Maya had been chosen as a prizewinner from the Salisbury Library”, said Joan. Maya was so excited to win her team jersey. She couldn’t wait to show her dad the shirt and said her uncle is a Bruins fan too, and he will be jealous of her win! The Bruins first teamed up with the MBLC and the Massachusetts Library System in 2009. The organizations work with libraries across the Commonwealth to make reading a part of summer fun for all ages. Tuukka Rask, Zdeno Chara, Brad Marchand and other Bruins players helped libraries develop Favorite Books of the Boston Bruins (available on mass.gov/libraries), a recommended reads list that includes librarians’ picks for the best hockey books. In 2014, over 400,000 people participated in statewide summer reading programs in libraries across the Commonwealth. Massachusetts has offered statewide online summer reading programs since 2007. Participants register, write book reviews, set goals and track their progress online. Massachusetts was the first state in the country to offer such a program. The Summer Library Program is made possible through federal funding from the Institute of Museum and Library Services.